One of my favorite things to eat when going out is pan seared lamb chops. I don’t know why this happens to be the case, pan-seared lamb chops aren’t difficult to cook. 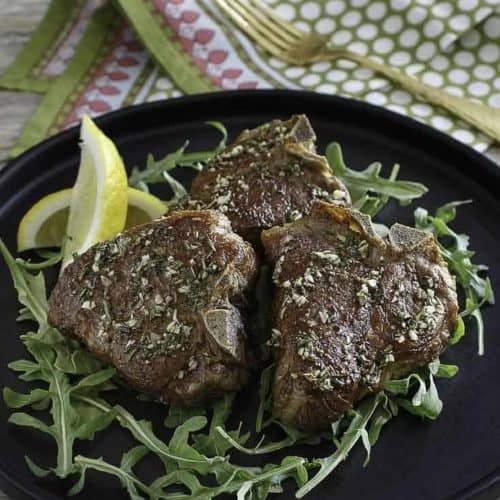 Lamb chops can be found in your everyday grocery store. Lamb may cost a bit more than beef, but you know it costs less than say a nice steak. Eating at home doesn’t need to mean that you sacrifice anything. I like cooking at home because I get to really choose my food, I get to know exactly what’s in it. 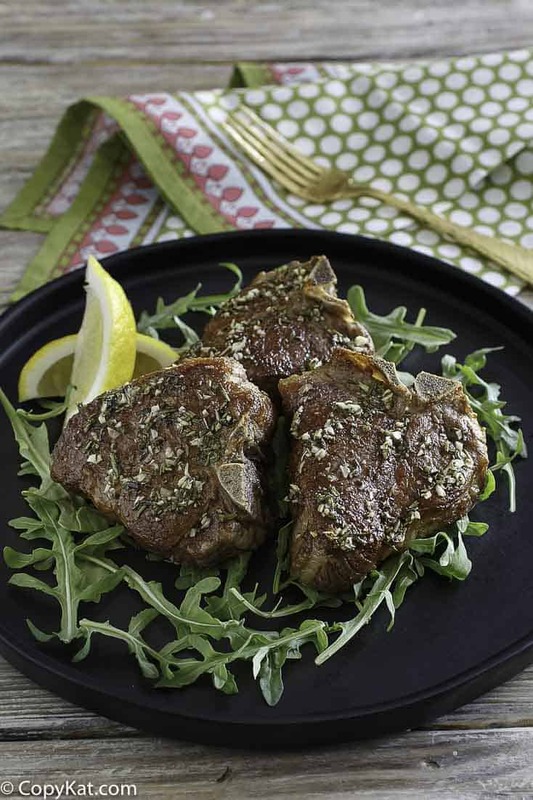 Pan seared lamb chops can be freshly made, with ingredients that are easy to find. I like lamb simply cooked, the meat is flavorful enough on its own not to require a sauce. 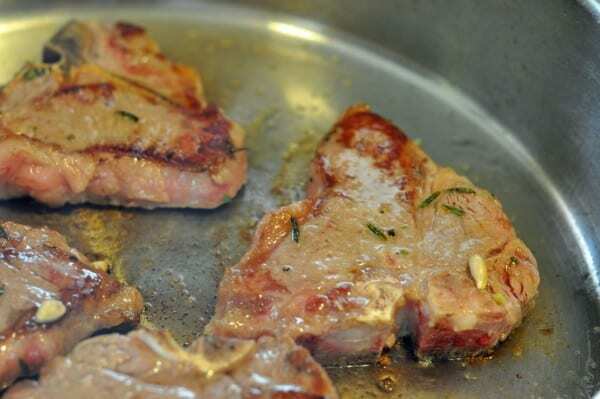 Here is my simple recipe on how to pan sear lamb chops. When buying lamb, go with the freshest. If the lamb is packaged, check the date stamp. If the lamb is not wrapped in a dated package, look at the color of the meat. It should be rosy pink or red in color. Any meat that is too dark is older and will not be as tender. In addition to the color, look for meat with a fine grain and firm, white fat. Other packaging information – Lamb marked as USDA Prime will have the highest rating in terms of tenderness and flavor because the lamb has a slightly higher fat content. Cuts labeled USDA Choice are still high-quality, but they will be slightly less tender. Grass-fed lamb – If you are concerned with how your lamb was raised and want to know that it had a chance to once frolic around in a field, then look for grass-fed selections of lamb at your local farmer’s market. Grass-fed lamb will cost you more, but you get high-quality meat with great flavor. Lamb chops can be found in your everyday grocery store. Lamb does cost a bit more than some other meats, such as various cuts of beef, but it still costs less than a nice steak. Lamb chops can come from more than one part of the animal. The cut of the chop determines its tenderness and how best to cook it. Loin chops – These are the most commonly purchased type of lamb chop. They are thick, compact, and meaty, and eminently suitable for quick, high-heat methods of cooking such as grilling or broiling. Rib chops – Rib chops are recognizable by their pearly white “handles.” They have very tender, fatty meat ideally suited for grilling or broiling. Shoulder chops – These are the least expensive lamb chops. Because they contain connective tissues, shoulder chops can be somewhat tough if not cooked properly. For this reason, they are best prepared by slow braising to transform them into a meltingly tender dish. What would you like to cook at home that you haven’t made in a while? Or, is there something you haven’t tried but have always wanted to? You don’t sacrifice anything by dining at home rather than going out to eat. In fact, eating at home has lots of advantages. You get to choose what you make for dinner, and you know exactly what’s in it. Whether you’ve cooked lamb chops before or have been afraid to try, here’s my simple recipe on how to perfectly pan sear lamb chops to make a delicious family meal. What should you be cooking at home that you haven’t in awhile? Is there something you haven’t tried, but you have been wanting to try? 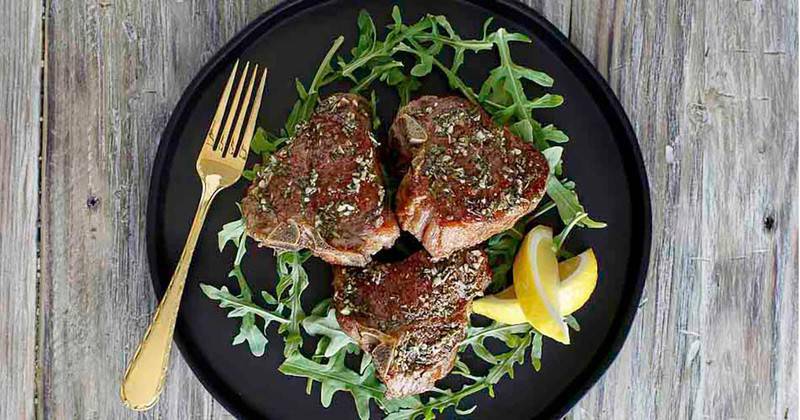 You can make lamb chops quickly and easily in a skillet on the stovetop. Trim off any excess fat from the lamb chops, and set aside as you make your marinade. Make a marinade by placing in a small bowl two tablespoons of olive oil, minced garlic, rosemary, and juice of half of a lemon. Mix together well. Spread one half of the marinade over the lamb chops, flip the lamb chops over, and spread over the remaining marinade. While this is being prepared I like to oven roast some small red potatoes, with olive oil, rosemary, and kosher salt. For me, having these flavors mimicked in another part of the meal makes my dining all the more pleasurable. Ideally, you should let the lamb chops marinade in this sauce for 30 minutes to an hour. Cover the lamb chops, and place into the refrigerator while the flavors mingle together. When you are ready to cook heat a pan to medium-high heat, check to make sure the pan is hot (add a couple of drops of water, and if they sizzle and evaporate immediately, the pan is ready to use). Add about a tablespoon of olive oil to the pan, and add the lamb chops. Depending upon how thick your lamb chops are, each side should cook 3 to 5 minutes on each side. When the lamb is cooked on one side, flip over, and squeeze the remaining lemon half over the lamb, and season with kosher salt. Cook lamb to your desired doneness. I have an it’s wonderful. Can you fry and put in gravy? I have never tasted lamb.Is it good? You are right, lamb chops are wonderful as they are. You can give a wonderful ethic context to the Provence spiced lamb chops with either a Moroccan tangene (of squash, raisins, dried fruit and agave or honey and Harissa) flavoring or a Jewish matza kuegel. To add a further micro-ethnic dimension, if using oregno in the lamb rub, vary it between a Mediterranean sourced oregno (Italian or Turkish) and a bolder Mexican oregno. This is a delicious marinade. I also use Frenched lamb chops and the Herbes De Provence rather than just rosemary. Thanks for sharing. Wrong type of chop. Rib chops are better. Perfection! I used Herbes de Provence in place of fresh rosemary. Thanks for sharing your recipe! I bet that was wonderful with Herbes de Provence. I love love love lamb. It’s so flavorful and when cooked right the texture is sublime. I sure hope I have some lamb in the freezer, because I’m feeling it now that I’ve read this post.